What is a Dumbbell Complex? A dumbbell complex is a type of strength circuit where you complete 2, or more exercises with a dumbbell back to back with no rest without the dumbbell touching the ground. Dumbbell complexes can be used as a workout, or within a workout. For your reference, I added a more advanced Barbell Complex workout a couple weeks ago. Dumbbell complexes are an advanced training method that should not be attempted by beginners. In this Dumbbell Complex example, I included two lower body exercises and two upper body exercises that hit different movement patterns. By including both upper and lower body exercises, the complex can be very aerobic as you’ll see when you try it. Choose a weight you can curl & press overhead 10x. Complete 6 reps of each of the following exercises with no rest between sets. 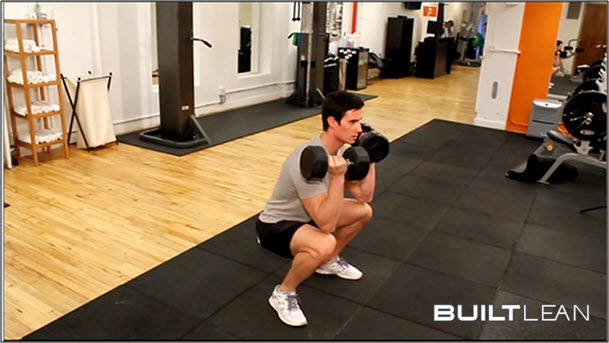 Complete 6 reps each side of forward lunges and 6 reps each side of alternating dumbbell curl & press. The dumbbell should not touch the ground from the time you pick it until after the last exercise. 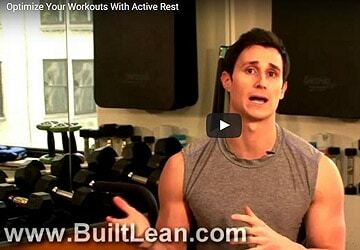 Beware this is a more advanced workout that requires great technique as you fatigue. The dumbbell front squat is an exceptional exercise that requires your deep core musculature to help stabilize your body. Because the dumbbells are being held in front of your chest, your lower back and abs needs to help keep your torso upright as you squat, which works you core as much, or more than any abs exercise. You also receive the benefit of stimulating your leg muscles as well, and most guys never do enough leg work. In the video, I’m squatting deeply well below parallel, but I’m still keeping my lower back straight. In fact, I’m squatting so low that my elbows are touching my knees. If you are unable to do this without rounding your back, don’t worry about it. Squat as low as you can comfortably. If you have lower back problems, a “goblet squat” is a better option where you only hold one dumbbell in front of your chest with both hands. Both methods are correct as long as you are using proper form. The former I find is more advanced, which activates the glutes and requires more flexibility. The latter method is better if you are unable to keep your torso straights lunging further forward, or are unable to step all the way back to the starting position. 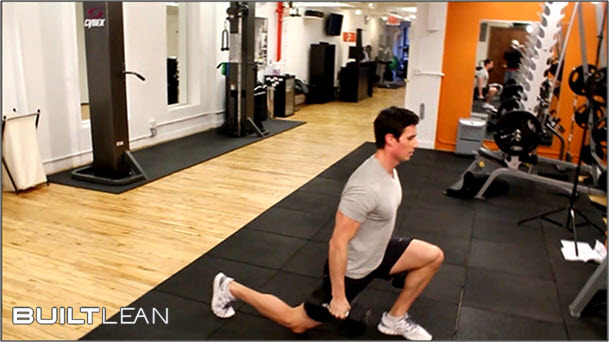 The forward lunge also requires power because you must push your body back to the starting position. You get strength, cardiovascular, and power benefits from this one simple exercise. The more common way is to do the former variation, which is absolutely fine. I chose the latter method because it’s a little easier for most people and there is more room for error (not that I want you using bad form!). Keep your back straight, head up, while pulling the dumbbells vertically from the ground in a smooth motion. After your shoulders and arms are nice and warm from the DB Bent Over Row exercise, you will then complete alternating DB Curl & Presses. Your arms and shoulders, especially the front of your shoulder, will get a great muscle burn. Be sure to use an athletic stance by keeping your knees slightly bent. When should I use Dumbbell Complexes? 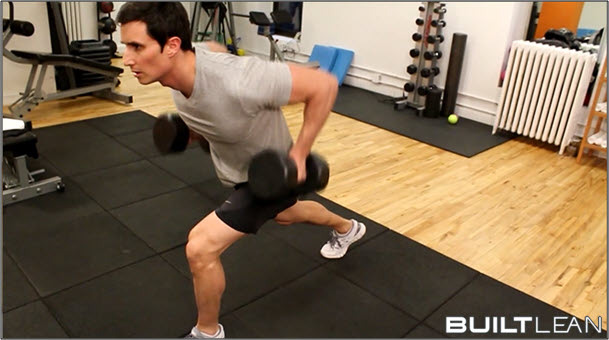 1) As a workout – You can choose a dumbbell complex that has 4-5 exercises in one and complete it for 5 cycles. That can make for a very short and intense workout. 2) End of a workout – You can use complexes as a metabolic circuit at the end of your workout to make your muscles scream and get a great sweat. Be sure to choose a light enough weight so that you are using perfect form at the end of a workout when you may not have as much focus because of decreased energy. 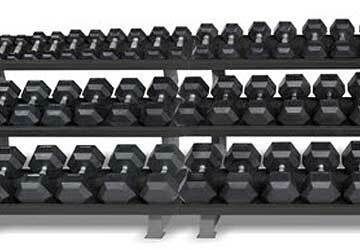 How do I choose the correct weight for Dumbbell Complexes? Choose the exercise that is the hardest in the sequence and then choose a weight that you can complete 10-15x for that exercise. For example, if you are doing 6 reps of each exercise and the hardest exercise is an overhead shoulder press, you can choose a weight you normally can press 10-12x. As you complete more cycles, you’ll be very happy you chose a lighter weight! How to choose the right Dumbbell Complex exercises? When constructing a strength circuit using Dumbbell Complexes, you want to choose exercises that flow well and where the exercises demand a similar weight. Regarding the first point, you don’t want to be switching hand grips, stances, and body positions to much as you move from exercise to exercise. My hands are killing me after a set of Dumbbell Complexes. Is this normal? Yes. I find the hardest part of completing a dumbbell complex is just holding on to the dumbbell for a good 1-2 minutes, which is how long each complex can take. If your hand grips is simply giving out before you can really push yourself, you can consider using wrist straps to help keep your grip. I generally do not recommend wrist straps, but you can definitely consider them for dumbbell complexes. 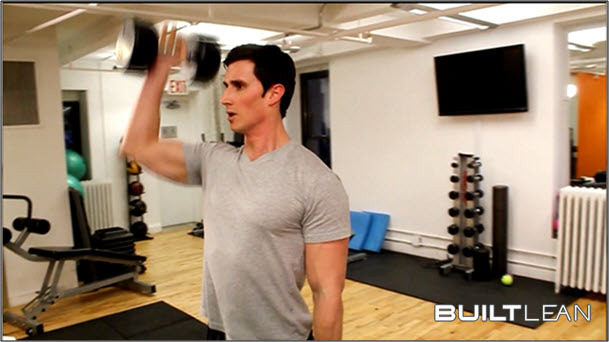 If you give this dumbbell workout a try, let me know what you think! Thanks brother. I only do weights three days a week. You think it would be a good idea to do this towards end of my leg day? Thanks for doing an awesome job,, I hope this business bring lot of success for you,, you deserve it. how many set do we do for each excersice? for a beginner? @Renz – Why not start with 2 sets and go from there. That should be ok. Just make sure to be careful with your lower back as you are completing these circuits and rest as much as you need between each set. I typically recommend that beginners wear heart rate monitors, and it can even be helpful as you get in better shape. It’s motivating to see your heart rate so you can keep it high, but not go too high. And almost forgot to answer your question, toward the end of your workout is ok if you use less weight, but if you want to push yourself with more weight, then choose the beginning of the workout. Hey Marc, I was told from a former personal trainer of mine when you do lunges with proper form, never to have my knee bent forward in front of my ankle. Is this true? Generally, yes, it’s true. In the video, my knee is not going over my toes. For those who are taller, the knee basically has to go over the toe in order to do a lunge. What’s most important is that you feel no pressure on your knee joint and the movement feels smooth and natural. I’ll be trying this tonight with some jumprope thrown in for good measure. Wow, I tried this tonight. It wasn’t a cake walk, but It was really good. It was as challenging as you said. I have lost 25lbs since the beginning of the year and I have another 30lbs to go. I work out with a trainer three days a week. On Tuesdays and Thursdays, when I’m not with him, I typically just do an hour of walking at variable incline on the treadmill or an hour on the elliptical, and stairs on Saturdays. Now that I’m stronger, I’ve been wanting to kick it up a notch. When I read this I thought this would be great to do on Tuesday and Thursday evenings and keep my hour of cardio in the morning. Are there benefits to splitting the workouts, or should I just do it all at once? Finally, do you have any suggestions about the best ways to burn fat vs. muscle? @mj -I would let your trainer know your plans. Ideally, he/she should either give you a plan for you to do on your own, or approve a plan you create for yourself. He/she is in a much better position to give you the best advice. Best way to burn fat is with intense strength training and interval training cardio in my opinion while keeping a calorie deficit eating whole, unprocessed foods. When you say this can be used at the end of a work out. What would be an example of a good work out before this? Cardio or other weigh-lifting reps? I heard that one must burn more calories than we eat to get the shrink wrap effect, do you agree? 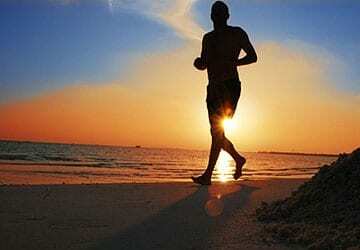 Does it mean one should do more cardio to burn that fat, then do your circuits to work the muscles? @Luke – I have a strength training bias, in that you can get cardiovascular benefits from strength training at a fast pace. In other words, you don’t have to do traditional cardio to get very lean, it’s simply not required. If you are doing circuits, then you are getting cardiovascular benefits. The idea is you are killing two birds with one stone. I would do this circuit at the end of a strength training workout for a few rounds, but don’t go too heavy. Also, this assumes you are in very good shape as doing this at the end of a workout is not easy. I love the idea of the barbell and dumbbell complexes to work multiple muscle groups one after the other while burning calories. I do have a question about how these fit into an overall workout. Your dummbell complex consists of exercises from these different muscle groups, which I would normally train on different days. I want to make sure that I give my muscles enough time to rest, so I’m not sure when I would fit this complex into my workouts. Can you offer any advice? @Crimson – I think you can include this complex on your chest back day at the end of the workout. 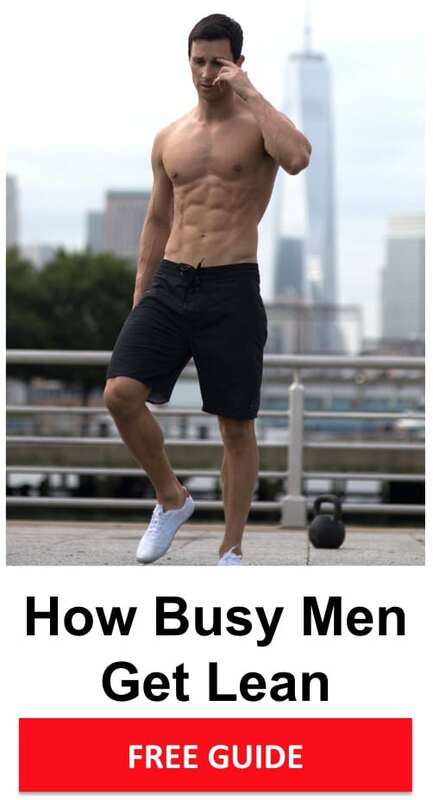 Also, I’m not a big fan of a shoulders/arms workout, unless you want to go on stage in a speedo and become a bodybuilder – that type of split is unnecessary. If you are focusing exclusively on muscle building, it can make sense. I would consider switching to 2-3 full body workouts per week, or an upper body/lower body split, which means less volume per muscle, but more frequency with which you hit each muscle, and less overall soreness and a higher fitness level. Also, doing shoulders and arms gets super boring, whereas you can get a lot more out of your workout by working more muscle groups and doing more exercises. I am focusing my weight lifting sessions on building muscle as I do cardio separately. Can you recommend any good full body routines, or is that primarily what you sell in your guides? What type of routine did you use to get in shape for the photos you have posted on your site? Did you do a body part split, or full body workouts? Also, I don’t get bored doing shoulders and arms and I do circuits of a shoulder exercise followed by a bicep exercise followed by a tricep exercise which are very time efficient. @Crimson – Sounds good. You can see a sample full body workout in my Get Lean Guide and search “workout” in the search bar to find other workouts on this site. By the way, nice article! Everything on this site seems realistic and do not sounds too fancy and hard to understand like any other site. Thank you and sorry for my language if it sounds weird(I don’t speak or write in English primarily). Ahmad – I think you can do this workout/complex 2-3x per week and take 1, or 2 days of rest in between each workout. Ideally, you would have other complexes/circuits to use as well. Your english is great for not being your primary language! Sir i m a 18 year old female and i have flabby arms. I want to tone them. Could you suggest me how to choose dumbbells for myself? I m right now 5’2ft and weigh 62kg. @Sakshi – Doing arm exercises will have absolutely no impact on whether or not you lose fat on your arms. Losing fat is a process where fat is broken down in the body because of a calorie deficit, meaning you need to eat less calories than you burn to lose fat. Furthermore, where the fat comes off from is genetically predetermined and you cannot control it. The solution? Lose fat without losing muscle! If you want to get your arm muscles bigger, then I would shoot for heavier weights. I am interested in doing this complex as a circuit workout. However, i’m not sure what a good rest period between rounds would be. Is 3-4 minutes more or less a good time for recovery? I’m looking at completing 5 rounds. @ym – I think 2 minutes if you are advanced and 3-4 minutes for intermediate. Sorry to bother you sir, but I really have a concern relating metabolic circuit training. When you say this can be done towards the end of the workout, does this promote that we can burn fat while gaining muscle? Thanks in advance :)…Again, sorry to burden you for such old dated topic. Ahmad – No problem. I strongly suggest you check out this article – Can You Lose Fat and Build Muscle At The Same Time?. After you read that article, then consider that metabolic circuit training can help you shed fat, but can also help you stay anabolic if during a muscle building program. Can i do this workout every day? Is it really necessary for me to workout 3x a week? 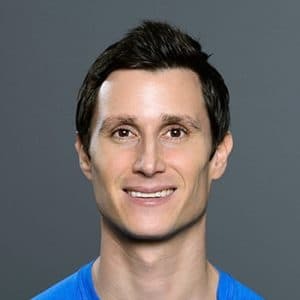 @Zack – you certainly could do it everyday as long as you scaled back the intensity and used lighter weights, but I would recommend 2-3x per week as a finisher (do a few rounds at the end of a workout), or as a workout in itself, but use enough weight so that it’s challenging and you feel the burn! Which part of this complex works the triceps? @Bilal – The triceps muscles are involved in the shoulder press part of the complex. Any pushing motion requires the use of the triceps muscle. I’ve always struggled with bent over rows due to an old lower back injury, and was thinking of writing them off completely. I watched your video and tried the split stance instead. It’s awesome! It doesn’t seem to aggravate my lower back at all. Great complex, thanks Marc! 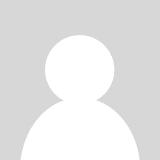 @siman – happy the video was helpful! Great article Mark and very useful! Was thinking of doing a DB/KB/BB metabolic finisher after my three weights workouts each week instead of doing boring cardio. Was thinking of incorporating hang cleans to push press, deadlifts, BB/DB rows, DB jump squats, Dips, Chins/pull ups, Push ups, KB swings, Ab rollouts and Burpees for 10 reps each, minimal rest between exercises and for 2-3 circuits (fitness allowing). Does that sound like a good way to help lose fat? Thanks! I m on the Built Lean Program in my second week. Do you think i can add this workout also in my program? I m pretty confused that i go to gym 3 times per week with 45-50 mins each day. When can i do this dumbbell complex? @Zahir – Happy to hear you are getting started with the program! The exercise/workouts I prescribe in the program is all the exercise you need. You do not need to do this Dumbbell Complex and it’s not in the program. With that said, if you really enjoy it, you can do this complex at the end of the workouts instead of HIIT. In weeks 3-4, HIIT will be required at the end of each workout. Good luck! OMG!!! i’s true this does work. i finished the workout and i felt like i someone who has been running for one hour. really really good all round workout. i am looking forward to the afterburn effect. many thanks Marc. but wont the body get used to this type shock after a while that it wont give thesame effect anymore? @Lopez – Thanks for the congratulatory message. Your body will eventually get used to it, but my guess is you can do this type of workout for a while, possibly even 4-8 weeks (depending on your fitness level) while still gaining strength and stamina. Over time, you can try to decrease the rest between sets and increase the resistance to make the workout harder. Of course, ideally, you can create your own dumbbell circuits and complexes to change things up, but consistency is actually very important. I started incorporating this DB complex , and I’m still just a touch weak on the balance in the DB lunges. I don’t falter or let the DB’s touch the ground, but I struggle and wobble just a bit. I’m wondering if this is because of bad form, and if it is contributing to my toe-touching flexibility reversing this week. I’ve worked up to touching the ground about a foot behind my feet, but this week I’m back to only touching the ground directly in front of my toes, because the back of my upper legs is tighter. I know you can’t watch me doing the lunges, but are there common mistakes in form I could check myself for, to improve my stability? @uncadonego – Lack of stability while you lunge can be due to a number of factors such as lack of flexibility, stability, or strength in your ankle, knee, or hip joints, lack of balance, an issue with your foot such as over pronation, or supination, or even your footwear. I don’t want to spoil a huge post I’m about to put up likely next week, but consider trying the lunges barefoot and see if it makes a difference. Marc, ah! That is probably it. Weak ankles! Over the years, I have sprained both ankles about 12 or 13 times each! I’m still doing the lunges, I just take my time regrouping myself after each “return” This is also the reason I have to substitute an upright bike for the 200 yard hard run then walk exercise in one of your other videos. I tried hitting the asphalt, but it just felt too “iffy”, so I stopped, Like you say, consider the risk-reward ratio. I won’t give up on the lunges though, I just backed off by five pounds on each dumbell, and as mentioned, am very methodical. hi marc, its me again Renz. i have a question, can i do this work out while i do yours? i will do yours during tuesday and thursday while i do the other one during monday wensday and friday. @Renz – I would strength train much more than 3-4x per week, that’s just my opinion. It’s unnecessary. Since my hands hurt after each set will they adapt to it or will it always hurt when im done with a set? Is it ok to do this workout while resting between sets or should i go on since im a beginner? Will doing this workout get me good results? @Geo – as I listed in the post, the hands not being able to hold on to the dumbbells the whole time is a challenge with this type of training. You could consider decreasing it down to three exercises and using more weight, of keeping it at 4 and using a bit less so your hands don’t hurt from trying to grip the dumbbells for a good couple minutes. If you are a beginner, it’s absolutely ok to rest between each set, you should listen to your body and ideally wear a heart rate monitor as well. I think this workout combined with others and a sound nutritional plan can certainly help you get solid results.